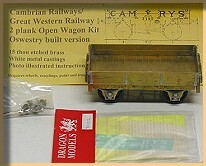 A part-built 7mm kit of a Cambrian 2-plank open wagon from Taff Vale and Dragon Models. You can see a review of this kit on Raymond Walley's site. The following is a list of some past and present kits for Cambrian Railways stock. Note that the list does not include GWR stock introduced after the 1923 Grouping. Many thanks to Roy Slaymaker, Colin Tarry, Chuck Soule, Adrian Marks and in particular Chris Yates for their input to the list. The list is not exhaustive, so if you know of any other kits, please do e-mail the webmaster.